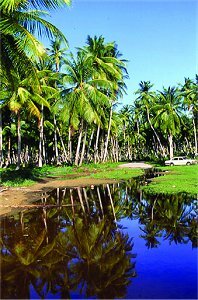 While you're here, explore and enjoy the island of Tobago! 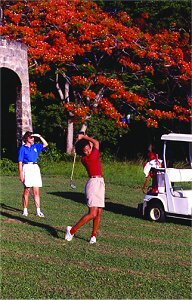 In your recreation time, challenge yourself to a round of golf at one of Tobago's two world-class 18-hole golf courses. Or why not play a game of tennis or go horseback riding? 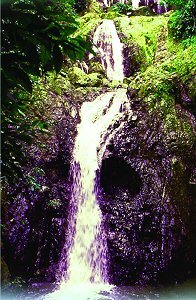 Venture to the Argyle Falls for a day of fun or spend a day amongst indigenous flora and fauna at the protected island known as Little Tobago, located off the east coast. Discover Tobago's wealth of tropical marine life by visiting one of the many fabulous dive sites around the island or go snorkeling in the clear waters. Take a glass-bottomed boat ride out to the renowned Buccoo Reef to view a striking array of corals and fishes and stop for a dip in the Nylon Pool. For a truly unforgettable experience, witness the endangered Leatherback Turtle trek up the shore to lay its eggs during the nesting season. For a change of pace, lounge leisurely in the sun at one of Tobago's many golden-sand beaches. Sunbathe or treat yourself to a delightful swim in our tropical waters. You may also engage in a number of water sports, including windsurfing and jet skiing. Tobago offers a wonderful variety of dining experiences. Choose from a multitude of restaurants whose menus range from sumptuous local and Caribbean dishes to fine international cuisine. 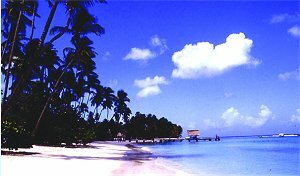 Whatever your palette, Tobago will please you! Come and see the wonders for yourself!